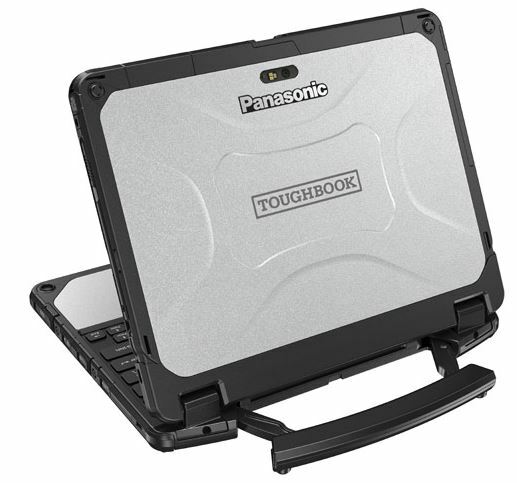 Panasonic Toughbook 20 Tablet, Keyboard, and Handle | Magnum Electronics, Inc.
Panasonic’s latest Toughbook 20 for mobile workers offers the flexibility of a tablet but includes a detachable keyboard with handle. For users who need a tablet but want a comfortable keyboard this is the solution. The Toughbook CF-20 handle makes it easy to carry on the job. At only 3.9 lbs, it has a sunlight readable display and can be used with gloves. It can be ordered with 4G LTE that supports multiple cell carriers. The Panasonic rotating hand strap is a recommended accessory for use in tablet mode. We found the Boston Lea ther shoulder strap easily attaches to the tablet and can be used to carry the emissive backlit keyboard too. There is also a rugged dock available designed for public-safety and utility vehicles. 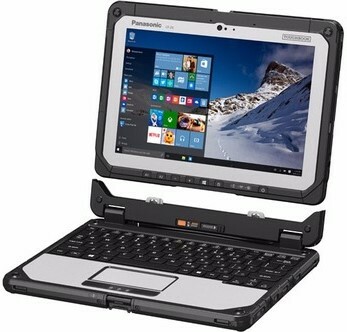 The Toughbook 20 ships with Windows 10 Pro installed but can support Windows 7 or 8 for older CAD systems. For a price quote or additional information call our Dover, Delaware office at 302-734-9250 during normal business hours or use the form below. This entry was posted in Mobile Computers, New Products, Portable Radios, Public Safety and tagged CF-20, military, mission-critical, Panasonic, Toughbook by magnumelectronics. Bookmark the permalink.